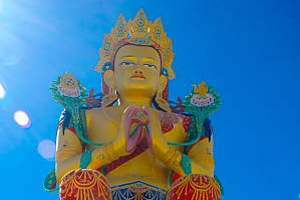 Leh Town ( Lat 34 10' N , Long 74 53' E ) is the district headquarter and the largest town of Ladakh Region of Jammu & Kashmir State. It is situated about 6 KM from the right bank of River Indus. The town lies about 3505 meter above the mean sea level. 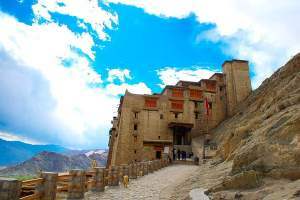 Originally the capital town Leh was founded in Circa A.D 14th century by one Khri-gstug-L de. It is pronounced as Sle or Gle in the beginning with the passage of time its spelling changed to LEH by Moravian missionaries, who preferred the German orthography. Leh is connected by Air and road from different parts of India. You can fly to Leh from Delhi and Srinagar. Most of the flights starts from Delhi and returns to Delhi. Leh airport operates in morning hours only so from Delhi to Leh you will find flights early in the morning and return flights starts from Leh around 7 AM till 11 AM. From New Delhi you can get Go Air , Jet Airways , Air India flights to Leh. From Srinagar you can get Air India to Leh. Duration of flight from Delhi to Leh is one and half hour. While flying to Leh try to manage one left side window seat to get the view of Himalaya from top. While approaching Leh you can see dry and Barren Mountains as there is no rain in this part of the Himalayan range. The only source of water is from melting of Ice. Before landing you can see Leh air strip from the top as flight take turn before landing. Being a military airport photography is not allowed in and outside the airport. From the flight itself you can hear announcements about the care to be taken because of low oxygen level at Leh. Altitude Sickness or High Mountain Sickness are two main problems tourist face after reaching Leh. There are two main connecting routs to Leh. One connects Leh to Srinagar ( NH 1 ) via Kargil and other one connects Manali to Leh via Rohtang Pass. These two roads closes during winter months and reopens only after clearing of snows in different mountain passes during the month of May. In both ways you have to take one night stay on the way as the journey takes two days to reach Leh town. 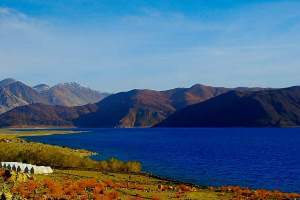 From Manali to Leh you have to stay at Sarchu making it two day trip. Alternatively you can stay at Keylong or Pang. If you are travelling from Srinagar side then you can stay at Kargil or Drass . 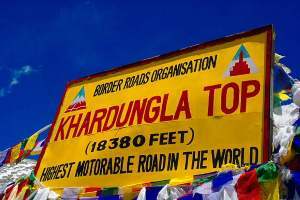 After opening of the roads in May month, Bikers and travel enthusiast from all over the world visit Leh by road. Bikes (mostly Bullets ) are available for hire from Manali ( Old Manali area many shops are there ) or from Chandigarh. You can carry your own vehicles to travel in Ladakh area. 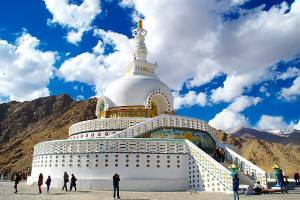 June & July are the peak months to travel to Leh � Ladakh. Health and family welfare department Leh Ladakh has display boards advising tourist on how to avoid AMS and enjoy their stay at Ladakh. AMS can occur to any one travelling to altitude above 10,000 feet. Any one going above 10,000 feet is susceptible to AMS thought there are tremendous individual variations with some people being more susceptible while other may be more resistant. The most common symptoms of AMS are : Headache, disturbed sleep, lassitude, Nausea, coughing , irregular breathing, breathlessness, lasstitude and lack of concentration. Since Leh is an altitude of 11,500 feet, it would only be prudent for you to take some sensible precautions so that your body can be properly acclimatized to the higher altitude and to the lower oxygen atmosphere. You must take complete rest for 24 hours preferably for 36 hours after reaching Leh. Take adequate amount of fluid ( i.e 2-3 liters a day ) but don't take excessive fluid. You can take table Acetazolamide ( Diamox ) 250 mg twice a day for 3 days to prevent mountain sickness. Above advice is displayed by Health and family welfare departments of Leh , however you are advised to consult your doctor and based on the advice take a trial does of Diamox tablet before starting your journey for Ladakh regions. 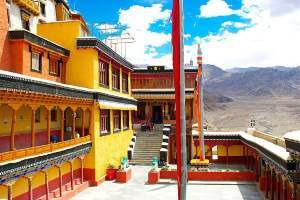 If you are travelling by road to Leh ( from Manali or Srinagar ) then one night stay on the way before Leh and gradually ascending to higher altitude will help in acclimatization but if you are directly travelling to Leh by flight then 24 hours to 48 hours rest at Leh is required before you start any sightseeing activities. In your travel itinerary, you will find rest on the first day of your arrival at Leh. Second day you can go for local sightseeing. All types of accommodations are available at Leh. Guest Houses for budget travelers are available near Leh Bus stand. Luxury hotels are available in different locations in city. Only postpaid mobile services are available in Ladakh region, no prepaid is allowed. Airtel, BSNL, Idea Network is available at Leh town but outside Leh it is only BSNL signals are available in most of the areas.